NOTE: Now that the conference has ended, I will be posting the date of any new additions as part of each newly added resource. 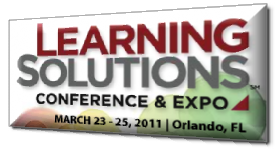 This post collects the resources shared via the backchannel of Learning Solutions 2011, being held March 23-25 in Orlando, Florida. The conference may be over, but the backchannel continues! I will be adding to this list as I continue to review the backchannel transcripts and find resources. I will tweet updates occasionally as additional links are added. If you know of a valued resource I should add to the list - or if something is inaccurate - please add it to the comments or tweet me a link to @LnDDave. Dave, thanks for all your work behind the curtain. GREAT job, Dave. I just saw someone tweet the phrase, "For those of you who will be attending Conference X via the backchannel, the hashtag we're using is..." How quickly this has become accepted and encouraged, thanks to people like you. Rock on! Oh my, I'm just coming across this! Thank you so much! What an amazing resource for those who couldn't attend. Blogging: Why did I wait so long?